There are some instances wherein you need to attach signature on a PDF file of your resume when you are applying for a job online and send it via email. Before, the only way we can do is to print the document, sign and scan then send it by email. This is a very tedious task. Actually, there are some easier and faster ways on how to insert signature to PDF file. Here, we will show you the quick ways. But before that, let me differentiate the electronic and certificate signature. Electronic signature is well known since it can be used easily. Users can simply sign documents with just the clicking the mouse or by using their finger prints. However, certificate signature is used to secure document so that it won’t be used by other people without authorization. With that, only those who have the certification can get access to it. LightPDF is a free online PDF tool which can insert signature in PDF online. This tool doesn’t require any installation or registration. It doesn’t have any limitation in converting from PDF to Word, PNG, JPG, PPT or convert Word, PNG, JPG, PPT, Excel to PDF. 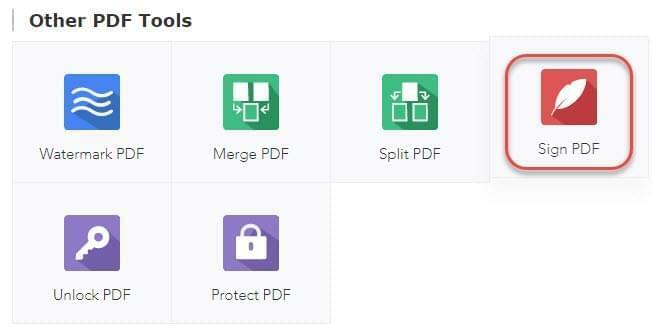 Furthermore, you can edit PDF file effortlessly by adding watermark, merging, splitting, unlocking, protecting and so on. Here is the simple guide on how this program works. Visit Sign PDF function page on your browser. Once there, drop the PDF file to the service. Next, click the “feather-like” button and “+ Create Signature” then “Draw Signature”. Draw your signature using mouse in the box. Click “Save” button to save it. After that, click the feather-like button and choose the signature you have drawn to add it on your PDF. Click “Save file” button on the top right corner. LightPDF will start to process the file instantly. 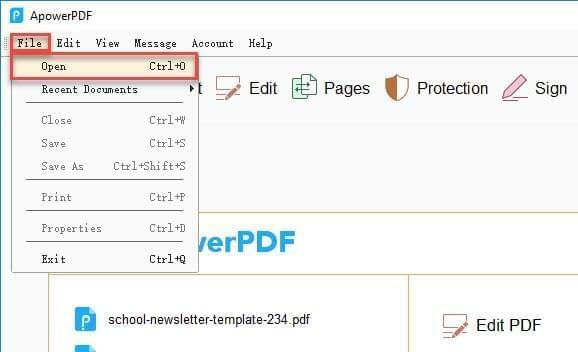 Click the “Download” icon to save the PDF file. To insert signature in PDF on your Mac, you can use Preview. This is a default tool for printing or viewing image and PDF file. It allows you to view, crop, markup, highlight, annotate, share and add signature to a document. Below are the steps you can follow in adding signature to a PDF file using this tool. First, open the PDF file with Preview on your Mac. Next, click the “Tools” > “Annotate” > “Signature” > “Manage Signatures”. Click “Camera” button to start creating signature. 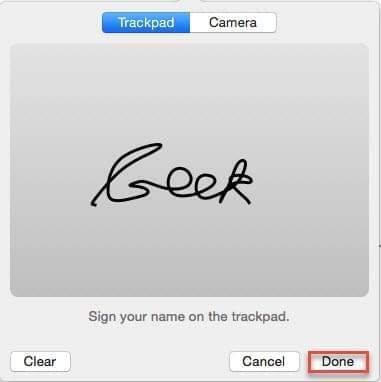 Put your signature on a piece of paper and hold up the paper directly facing the camera of your Mac so that your signature will appear on the blue line. Preview will help you draw a virtual signature based on your manuscript. Click “Done”. Or click “Trackpad” and sign your signature and click “Done” to save it. 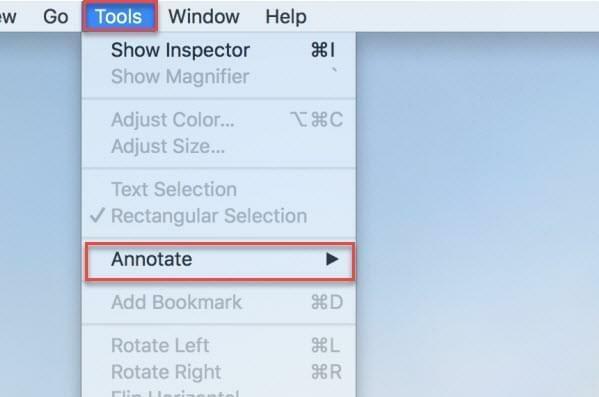 Finally, go to click “Tools” > “Annotate” > “Signature” and select the signature you just create to add it to your PDF file. 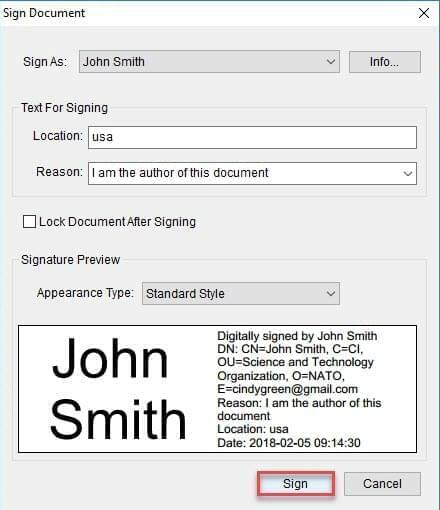 If you want to insert digital signature in PDF, ApowerPDF can help you do it. This is a tool which you can use to create a new PDF file and convert PDF to other formats such as JPEG, PNG, GIF, TIFF and Bitmap. Moreover, it allows you to add texts, images, watermark, password, manage PDF pages and many more. Follow these simple steps on how you can add signature with this tool. Download the program and install it on your computer. Run the tool once installed. Open the file you wish to add digital signature by clicking “File” > “Open”. Once done, click the “Sign” button then click “Place Signature” > “Draw New Signature Rectangle” to drag the area where you want to show your signature. 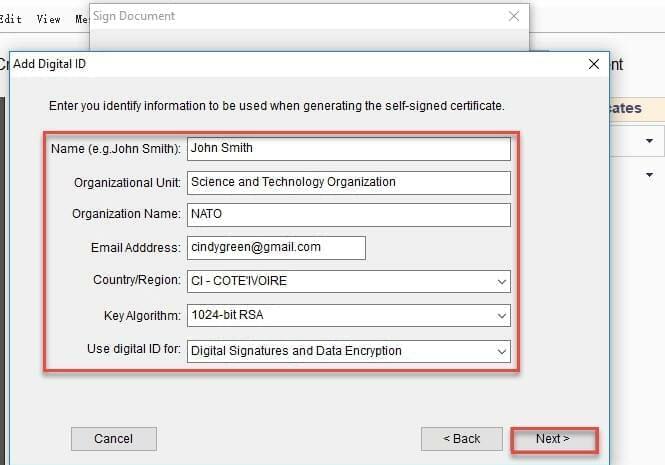 Select “New ID” in Sign As menu if you want to create a new signature for adding in your PDF. Select “A new digital ID I want to create now” if you don’t have an existing ID. Click “Windows Certificate Store” > “Next” and fill in all the forms appearing on “Add Digital ID” window. After that, click “Next”, input your password and confirm it and click “Finish”. Click “Sign” to add the created new ID to your PDF. 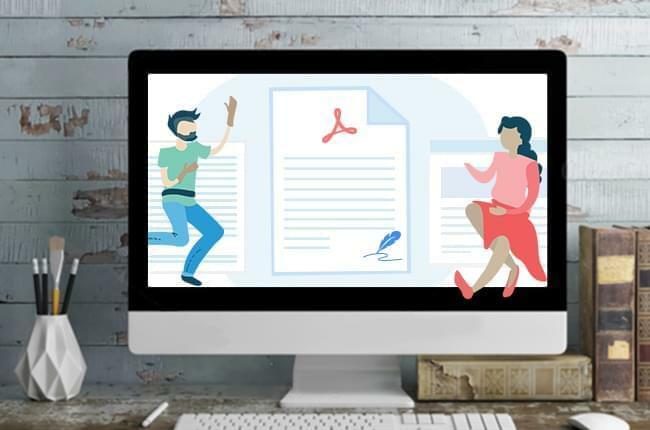 These are the easy and effective ways to insert signature in a PDF file. 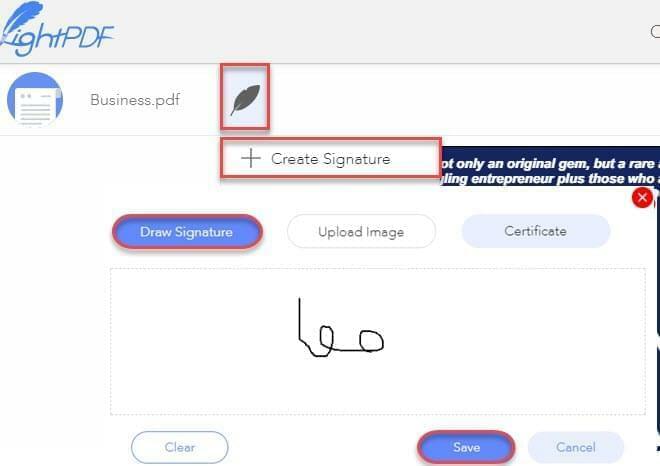 If you need to add electronic signature, you can do it for free by using LightPDF. And Preview is a very handy tool for adding signature to PDF on your Mac. If you have requirement for inserting certificate signature to PDF, you may choose to use ApowerPDF. In comparison, it has many more useful functions than the other two tools.